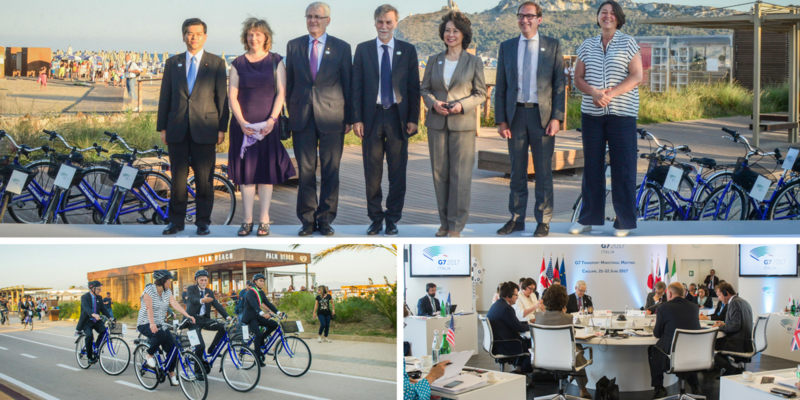 The meeting of the Transportation Ministers of the G7 countries, hosted in Cagliari on June 21-22, concluded with the adoption -- by the G7 countries and the European Commissioner for Transport -- of a joint declaration	on the social value of infrastructures. In recognition of the social role infrastructure plays in contributing to social well-being, the document underlines the importance of investing in high-quality and innovative infrastructures as a key strategy to sustain economic growth, to facilitate access to health and education services, and to increase employment opportunities. Well-planned investments in infrastructures can trigger economic, environmental and social benefits. Particular attention was paid to ensuring sound planning in selecting the most beneficial projects and in generating the highest added value, based on cost-benefit analyses. The document also highlights the importance of stakeholders' and local communities' engagement and participation in the different phases of decision-making processes. The G7 countries came to the conclusion that it is necessary to encourage and facilitate the involvement of private capital, and to reap the benefits of Private-Public Partnerships. Furthermore, in order to learn from their respective experiences, G7 countries intend to establish a working group on infrastructure development to exchange best practices and innovative ideas on planning, funding, financing and implementing projects with a view to making recommendations to the Ministers. Joint declaration also stresses that advanced technologies for vehicles and infrastructures will not only transform road safety and environmentally-friendly mobility, but will also provide new transportation solutions that can benefit all segments of our populations. To achieve these ambitious objectives, the G7 countries reaffirmed their commitment to identify and remove potential barriers to the introduction of automated guidance technology and to connect to existing regulation systems at international and country levels. The G7 Transportation Ministers recognize the strategic value of investing in technology, in terms of security, emissions reduction and optimization of the use of road networks. The G7 Transportation Ministerial Meeting was attended by Italy's Minister of Infrastructure and Transport, Graziano Delrio, Canada's Minister of Transport, Marc Garneau, Germany's Federal Minister for Transport and Infrastructure, Alexander Dobrindt, Japan's Minister of Territory, Transportation, and Tourism, Keiichi Ishii, the UK Secretary of State for Transport, Chris Grayling, the US Secretary of Transportation, Elaine Chao, the EU Commissioner for Transport, Violeta Bulc, and the French Director General for Infrastructure, Transport and the Sea, François Poupard.